So you're interested in tiny house plans. I'm excited to build my own one day too. For now I live in a 500 square foot apartment with my fiance. 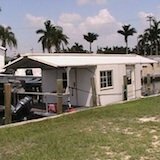 Most of their building plans for tiny houses on trailers start at $859 but they can all vary so use the more information links to get the full details. 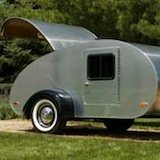 I think this is the best choice if your planning to build on a trailer. 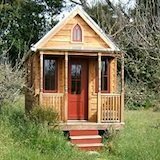 This is their smallest house at 65 square feet. It has a couch, stainless steel desk, sink and fireplace. A wet bath, two closets, and lots of shelving. This house was designed for one full time resident. There's room for a small refrigerator below the kitchen counter. This house is the easiest to remove from it's wheels. This is the model that Jay's lived in for a while. It also has a large stainless steel desk, a tiny fireplace, sink, refrigerator, oven, wet bath, stove top and lots of storage. This model is based on the Epu that we talked about above. One of it's unique characteristics is the fold out bed in the downstairs area. The Lusby is one of my favorites. It has a full bathroom, a kitchen, a little fireplace, a loft for sleeping and storage and a downstairs bedroom. There are two good sized closets and lots of shelving throughout. There are cathedral ceilings in the main area because the loft only extends above the kitchen and bedroom. The Tarleton is similar to the Lusby. The kitchen here is a little bigger and there is no bedroom downstairs. So instead there's just a more spacious living area. The Fencl is a combo of the Tarleton and the Weebee. It has the tall cathedral ceilings over the main living area, and a sleeping loft above the kitchen and bathroom. At 130 square feet this model feels quite spacious for what it is. "I just want to learn more!" If you're not ready to buy plans yet, but still want to learn more about how all of this works... Including how these houses are built on trailers order the Small House Book by Jay Shafer. The book's $29.95 and well worth it. It's filled with color pictures and interesting information from Jay and his 10 years of experiences living in tiny houses. Plus he'll show you (with pictures) how to construct a foundation on these trailers. 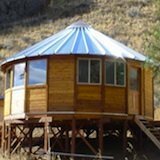 Also when you join our free email newsletter on tiny houses, we'll give you 6 tiny house plans you can download at no cost.